Now, it is time for a new Design Team Call. We are looking for crafters from all over the world who love to create with Pion Design papers! To start with, we are looking for guest designers, and later some of our guest designers will have the chance to become Pion Design Team members for the rest of 2012. As a team member, you will receive a generous amount of Pion Design papers to work with. What we would like from you are a minimum of 2 project posts per month on your personal blog as well as for our blog and to promote our products on at least one major online gallery. Anything extra is appreciated. Please send your application to jenny@piondesign.se Write a little about yourself and tell us why you want to be a member of the Pion Design Team. Link to your blog and let us know if you have any other design assignments. Send us 3 pictures of projects made with mostly Pion Design papers in size 1000×1000 px. These projects do not have to be newly created for this call and may be older projects. We just want to get a sense of your design style and how you use our papers. 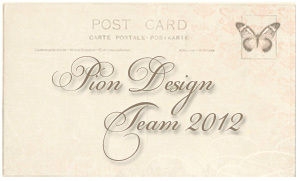 Please write Pion Design Team 2012 Application as your e-mail subject. This DT call is open until the 8th of January 2012. We’d love to have you list your call with us at DesignTeamCalls.com. Just fill out our self-service form and your call will appear in our listings instantly. Just came across your beautiful blog tonight and wow the projects you all make are amazing and the papers are gorgeous and oh so soft in tone..beautiful! Happy New Year to you all and wishes of health and happiness for 2012!